In a previous article dental implant dentures (also known as implant overdentures) we discussed the difference between normal removable dentures and dental implant dentures. Dental implants are small titanium screws that are placed into the jaw bone to support a crown, bridge or denture. 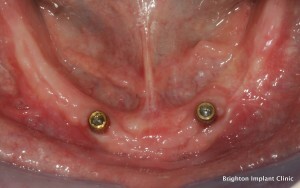 With implant overdentures the implants act as supports for the removable denture. With dental implant dentures it is much easier to speak, eat and function with dentures. However the cost of the dental implant dentures were not discussed. Conventional dentures vs dental implant dentures. 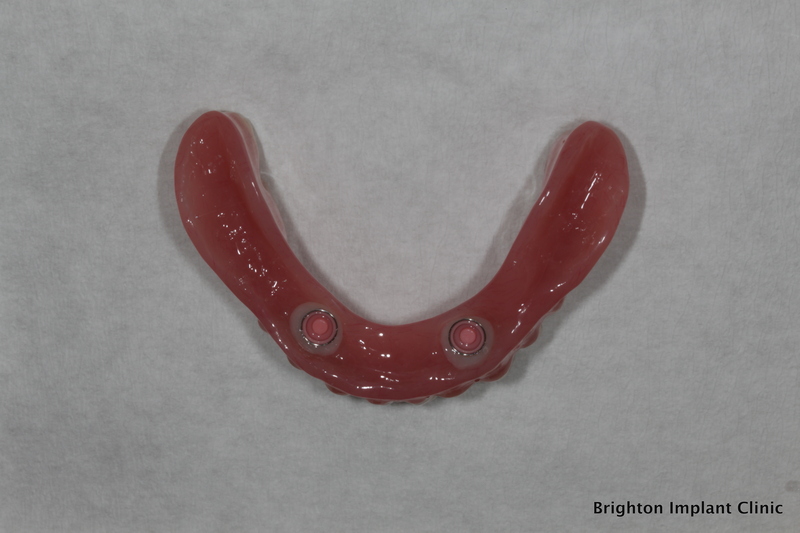 A removable upper or lower denture at Brighton Implant Clinic costs £395. 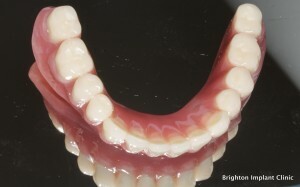 This price is per denture for either the upper or lower full denture. A full denture only has suction holding it in position during speech and function however a dental implant denture is a whole lot better. With dental implant dentures the denture is clicked onto dental implants which are accurately placed into the jaw bone. This means that the denture itself is supported and secured on the dental implants. The cost of a dental implant denture varies between the upper and lower arches. The difference between the two is down to the fact that we need more dental implants for the upper dental implant dentures than we need for the lower arch. With full upper dental implant dentures we need a minimum of 4 dental implants. The bone in the upper jaw is much softer than the lower jaw and hence we need a greater amount of support in the upper jaw so that each dental implant will work effectively less during function. In the lower jaw we only use 2 dental implants in order to support a dental implant denture. The bone in the lower jaw is more dense and able to support dental implants more strongly than in the upper jaw. How much do dental implant dentures cost ? definitive full upper or lower dental implant denture secured on the implants.